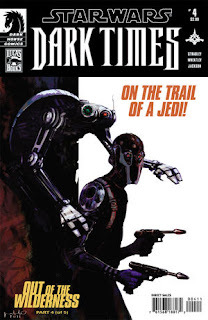 The Fellowship was fortunate enough to obtain a copy of STAR WARS: DARK TIMES—OUT OF THE WILDERNESS #4 from Dark Horse Comics. Randy Stradley writes, Douglas Wheatley pencils, Dan Jackson colors, and Michael Heisler letters. This book is part four of a five-part arc. Jenner and company are on a desert planet, and his associate Ember has been abducted and used as bait by an assassin who’s gunning for Jenner. The rest of the team is tracking them, but will they make it in time? This book is loaded with incongruity. Not in a bad way, though, which I find fascinating. For example, the arc is supposed to be about some anti-Imperial espionage, with Vader hunting down the culprits. But what we see here is a Jedi fighting to save a friend on an out of the way world. Also, the hostage situation is usually a pretty dark element, but there’s a good deal of humor in this part of the story. But since sidetracks and wry humor are a part of why we love STAR WARS in the first place, it all fits together neatly. I like this book, and the incongruities make me really curious as to how they’re going to wrap up this story arc. How will they get back to the espionage, and will Vader show up in the end? STAR WARS: DARK TIMES—OUT OF THE WILDERNESS #4 is available now at your FLCS or by order from darkhorse.com.